There is one notion that, in particular, most Americans and certain Europeans share. It’s the notion that the opinion and desires of a given individual actually matter to the powers that be, the illusion that democratic procedure actually works and that even a relatively small interest group can affect management decisions of a business. While it may appear to be true, in reality this requires some very special circumstances and strategies to work, as neither a governing body nor a business management is actually interested in fullfilling the desires of individuals or small groups — while formally, their personal wellbeing is tied to the satisfaction of the population at large, the actual metrics of this satisfaction are not anywhere as clear-cut or obvious as individuals tend to believe. Ever heard of public choice economics? Look it up. The advantage of living in Russia is that while formally, the same democratic mechanisms are in effect, the said illusion is nowhere as popular. Makes living a lot more obvious, as you don’t waste time trying to get what you want in the ways that are known to be broken, you just learn to look for other ways or do it on your own. Unfortunately, in Second Life, this illusion is quite popular — the mantra “Your world, your imagination” may have something to do with it. I have already mentioned that Second Life’s early basic design is not meant to support life, that from the very start it was meant to be something else entirely, and the current situation is not sustainable. It never was, it never will be. The management is not interested. The current Second Life’s money making model is based on fast user turnover, and is actually a means to remain profitable until corporate acceptance occurs. Now that the turnover is not fast enough, they have no choice but to impose extra fees. Hey, it worked with openspaces, everyone yelled and cringed and cried but still paid. You brought this on yourself, mind you. You have collected Linden Bears. You have visited Kiss-a-Linden booths on Valentines. You formed fan clubs. You have shouted with glee when Lindens purchased your products. You are stupid enough to actually try to ban copybot-capable viewers, so that there really isn’t a way to pack up your things and leave anymore. If you did any of that, you’re getting exactly what you deserved. Naturally, any given, individual Linden employee may be a nice and reasonable person. They may even have ideals and opinions that you share. But you can only be personally nice to someone you personally interact with, not to the hundreds and thousands affected by your management decision. “They own it” is the rebuke I usually get for saying that. Someone owns the phone network as well, and it took them many years, but eventually constant whacking from other powerful figures made them evolve a set of impartial rules. But you’re not going to get anything from Linden Research Inc. by self-mutilation — delisting goods, trying to stop all trade for days, public demonstrations and petitions… Their target clients are corporations that are interested in virtual office space. Not us. It’s as simple as that. We are dependent on a monopolist that has locked us in by preventing us from exporting our content outside the platform, and that monopolist is actively hostile. That this is actually a corporate delusion does not mean it’s not happening anyway. And by “deal with it” I don’t mean “sit on your hands and do nothing”, but “do something they can’t actually stop and will actually care about”. Go dust off your first life name. I’m sure you can think of something you, personally, can do. A little gimmick for Second Life plurkers, SecondSecrets. This is a robot that will automatically replurk anything that is plurked privately directly to it with no other recipients – anonymously. No logs are kept, email notifications of private plurks are turned off and I couldn’t care less, so if you delete the private plurk once it has been replurked, there’s no way to figure out who said it. P.S. : Oh, for the curious, here’s the full source code, really simple. Will find objects by name, using both partial and complete name matching. Can position your camera so that the object is easy to see and click. Partial name searches are not case sensitive. Sound alerts when objects are found (audible only to the wearer). Can dump the positions of all treasure hunt items found into your chat log as SLURLs for easy sharing. Can give you URLs that can teleport you to the object in one click when used within Second Life. Will keep working on no-script land. Networks with other copies of itself for collective searching! Agree on a search string, and move in different directions, you’ll find things far faster! Properly handles moving and disappearing objects. No longer stops searching at all upon sim change or teleport. Over a thousand copies sold, 101 XStreet votes and most of them at 5 stars. 🙂 If you have one, just wear it and you should receive a box with the new version more or less immediately. Those “CEO” group tags are widely disliked for a reason. I’d like to expand a bit on that reason, though. Just like I’m normally the first to say that there is nothing about Second Life that is any less real than the First, so I will be the first one to say that there is a limit to claims of professionalism in it, and there’s no contradiction, both are the sides of the same coin. Pretty much every Second Life business, with very few exceptions, is essentially a garage operation. One, possibly two or three people, perform all the required tasks. There are very few people out there for whom Second Life business amounts to a day job. Notice that these are usually reluctant to say the words “CEO” or engage in much corporate marketspeak. The definition of professionalism is not in getting paid for work, nor does work commonly called professional somehow magically become better in quality than something done by an obsessed amateur — obsessed amateurs tend to do better on many an occasion. Professionalism is about taking responsibility for results — delivering the work promptly and on time, consistently, and with a certain expected quality, and obeying a certain code of behavior towards customers, wherein a customer may not be always right, but once they are a customer, they get the exact same treatment as any other customer. A public image of a corporation offers a certain insulation between the customer and whoever actually does the work — now the worker is absolved of the need to be professional, because if they can’t be, someone else will pick up the slack. Now, if you say you are a “CEO” in SL, you are essentially asking to be protected by a public image of a noncorporeal corporate entity that still cannot be more professional than it’s individual participants, because at heart it remains a garage operation — there’s still nobody to pick up the slack. There are many reasons to do it, naturally, but the desire to avoid responsibility in case it arises would be the most common, or at least, the most perceived, whether present or not. A garage operation that pretends to be a corporate monster is amusing, if not outright suspicious. Well, don’t you think we have enough of that in the First Life? If you did not deploy it yet, just use the new version. If you did, you can simply replace the “Mailer” and “zht_TimedUpdateCheck” scripts in your deployed Rezday Device(s) with the ones from the new version. Everyone who bought it should receive the update automatically. New release time! Been ages since I had the time to push anything new out. The Rezday Device will allow your shop visitors to send a selection of your products as rez day gifts for free — assuming the person they try sending a gift to really has a rez day today. While there are arguments against free product distribution, this is good advertising by itself, and most importantly, it results in added exposure by stimulating word of mouth. People are not allowed to send gifts to themselves, even if it is their rez day — gifts can only be sent to someone else, who, presumably, haven’t heard of your shop yet. Even if they did, and drag a friend over to make them push the button for them, chances are the said friend could be interested in your merchandise. At the very least, they will probably remember it next time someone has a rez day. Only one gift per avatar per rez day can be sent, no matter how many Rezday Devices you have deployed or where, and the limit is enforced by using an offworld database. There’s no chance someone can possibly acquire your entire gift inventory as rezday presents in a single day — they can only get one gift from you this year even if multiple people attempt to send them one. Naturally, multiple people may receive gifts from you on any given day if their rez days are the same. Being zero days old does not count as having a rez day, so this cannot be abused as a cheap way of outfitting a new alt. The above limitations should make it reasonable to populate the Rezday Device with products you otherwise expect to be paid money for, as potential profit losses will be low. 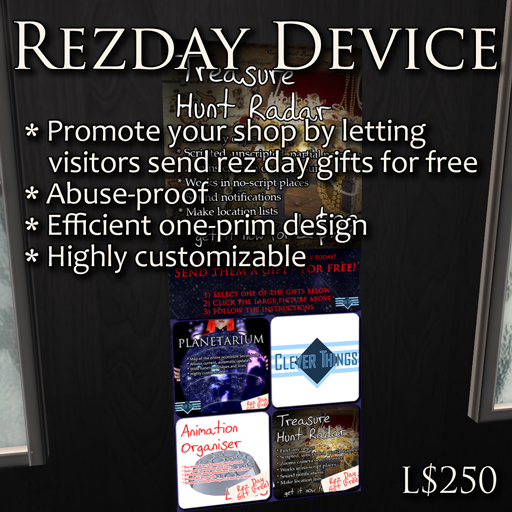 A shop that is the origin of a nice rez day gift is likely to get good publicity, and having such a device in your shop makes you first on the list to check for a good rez day gift. You may want to try distributing gift cards in this manner if you have a suitable gift card system. The economical single prim design allows you to place up to 64 products into one Rezday Device (you can, in theory, have more, limited by script memory, but texture resolution imposes practical limits on the number of products that can be effectively squeezed onto the selection panel), allowing people to select them by clicking specific points on a texture, which is particularly handy for clothing or furniture which comes in a wide selection of colours. Multiple copies of the Rezday Device will safely coexist in one location. An email notification can be configured to send you a message whenever a gift is sent in this manner, allowing you to keep track of distribution without worrying about possible instant message capping. You can see the complete manual online in my manuals section. The device itself can be purchased in my main shop and on XStreetSL for L$250. Packaging, writing manuals and setting up vendors and XStreet. The annoying part is that while development and debugging is more or less linearly dependent on how complex the product is, making it pretty and packaging takes time that cannot be effectively reduced. Most of this work cannot be effectively delegated, except the third stage, in particular, setting up vendors. And, well, the latter third is the most problematic and annoying part of the whole thing, I have lots of things almost ready for release because they got stuck on the second or third stage. Most of this work cannot be delegated, just like a lot of customer support cannot be. For much of it, though, there’s no technological reasons why it could not be delegated. Some stores employ the concept of store alts, which are a crude equivalent of incorporating a business – but it’s a) too crude, and b) against TOS as written, because you are not allowed to share an avatar account. There is, essentially, no legal support for incorporation. Previously, when XStreet had a separate account structure, a certain degree of management could be achieved by sharing an XStreet account — it’s safe if you don’t misplace your PayPal password, and since everything is logged nicely, any misappropriation of funds or stock is easy to catch, it’s even less dangerous than giving someone the keys to the warehouse. Well, now you can’t do it, because XStreet taps into the regular avatar account structure. Hippo recently went out with a Manager feature, where you can delegate access to quite granular parts of the web side of the system for an extra fee, which solves the problem for the part I wanted it to be solved (Some important things done by managers do not get logged, which makes it’s usefulness rather limited, it was enough for me but might not be enough for you…) — but having the same for XStreet would be mighty useful and easy enough to implement. And we aren’t getting it now that XStreet is owned by LL. Fun.